← Lazy Girl Guide to Peru Part 3: The best part of Peru, the FOOD! So I started this post a few days ago and finally finished it! I guess the lazy in me is really coming out, even when doing something I love! I consider myself to be a connoisseur of cupcakes. I love all things about cupcakes. I used to bake, but after moving out on my own and being a broke grad student, I lack the kitchen utensils to bake. 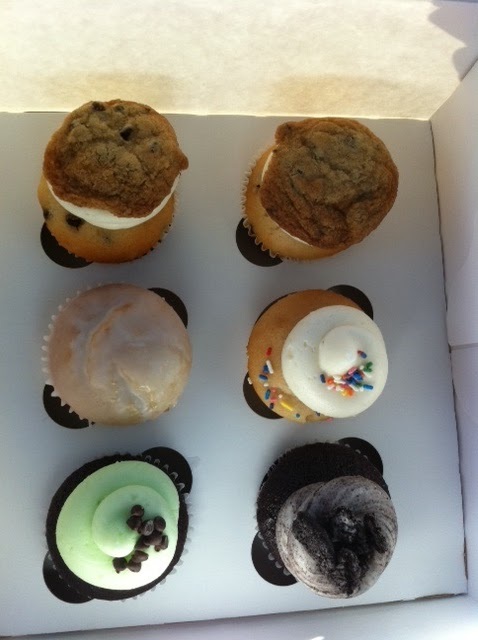 Luckily Vegas has many many cupcake stores and I have frequented many of them! So how does one decide what a good cupcake is? I guess it’s really up to you. For me I prefer a good, moist cake, with buttercream frosting. I LOVE frosting! I get sad if there isn’t frosting with every bite of cake! It doesn’t always have to be buttercream, but I’m not a fan of whipped icing, it just doesn’t have enough flavor for me! There are four places in Vegas where I have tried cupcakes, I have a living social deal to a 5th, but I haven’t had an occasion to get a dozen cupcakes (I have to have an occasion, otherwise I eat them ALL, and usually within two or three days). The four places are Retro Bakery, The Cupcakery, Madhatter Cupcakes and Gigi’s Cupcakes. The first three are local to Vegas, Gigi’s is a chain with locations across the US. I just had Retro Bakery for the first time a few days ago. It is a good twenty minute drive from my apartment, at least! But I had heard great things and had to try them out. I also follow their owner on twitter and she is HILARIOUS (@RetroBakery)! You can buy cupcakes single, four, six or a dozen. There were so many good flavors I went with 6. The top two are milk and cookies- chocolate chip cake with vanilla buttercream and chocolate chip cookie on top ( MY FAV), middle left is glazed donut ( i bought this for ff5 since he hates frosting), middle right is vanilla loves vanilla (YUMMY), bottom left is mint chocolate chip (I gave to my bff, she LOVED it) and bottom right is cookies and cream (OMG HEAVEN!) These cupcakes were great!! I had 3 of them, all great, ff5 loved the glazed donut, and my bff thought the mint chocolate chip was great and a fun new flavor. The only negative I would say is they don’t last long, so don’t plan on saving them for more than a day or two. The buttercream is great, not too sweet! There is just enough icing and the cake was great! I can’t wait to go back and try new flavors! If you live in vegas or are visiting soon check out retro bakery’s website here! Next up is the Cupcakery, probably my least favorite in town. I don’t have any pictures, but they make really pretty cupcakes. They have interesting flavor combinations, but my main issue is the dryness of their cupcakes. The cake is just bad, it’s unfortunate because they are located all over vegas, but its not worth the money, unless they’re just for decoration! But if you’re interested in trying them out click here. Madhatter cupcakes are my favorite! It doesn’t hurt that I only live 5 minutes away! I found Madhatter’s cupcakes before I even lived here, and I’m obsessed! They offer a frequent buyer card, which i’ve gone thru multiples of! The cupcakes last for days! The cake stays moist for days, I think I’ve eaten them a week later and they’ve still been delicious! They don’t put too much frosting, and it’s just the right amount of sweet. The great thing about the store is you can pick all your flavors. You pick the cake (they have MANY options daily), then the filling ( I never do a filling, it just becomes too much frosting for me) and the frosting! They also give you a free decoration! It doesn’t get much better, especially if you have a crowd and want a variety of flavor options! Check out there website here! Last cupcake store is Gigi’s Cupcakes. It’s a national chain. They have set flavors. They are HUGE cupcakes! With more frosting than you can imagine. Their buttercream is rich and delicious! It’s hard to eat one cupcake without getting a stomachache. I can only eat half at a time and I can usually eat two regular cupcakes at a time! NO JOKE! The cake is average, but I think they’re mostly about the icing. I tried this store out because its right by UNLV (where I’m in grad school) and I had a groupon. Check out their website here! You can see all the frosting below! Next up on my cupcake tour of Vegas is Shanni’s Cupcakes. Not sure when that will be, but sometime before October! Find what you like! I know I like moist cake and good buttercream icing. I also love creating my own combinations! Check out twitter! I would have never found retro bakery if it hadn’t been for twitter. After reading the owner’s tweets every day, I wanted to support her business and drove 20 minutes out of my way just to try her cupcakes! And it was TOTALLY worth it!! If you’re on a budget make your own. I plan on making these from Courtney’s Blog Sweet Tooth, Sweet Life next! And if you love to make your own cupcakes her blog has AMAZING recipes!